The main opposition Maldivian Democratic Party (MDP) suspended its rally on Thursday night after privately-owned Sangu TV broadcast the event live without permission. MP Ahmed Mahloof told Minivan News an opposition supporter had removed Sangu TV’s microphone from the podium at the opposition’s campaign office or Haruge, resulting in a confrontation between “gangsters” who supported the TV channel and opposition supporters. Sangu TV however said the group were its staff. The rally was suspended for 40 minutes and restarted at 11:45pm. “This is very disappointing coming from a party that supposedly works for press freedom,” Miuvan Mohamed, head of news at Sangu TV, said. 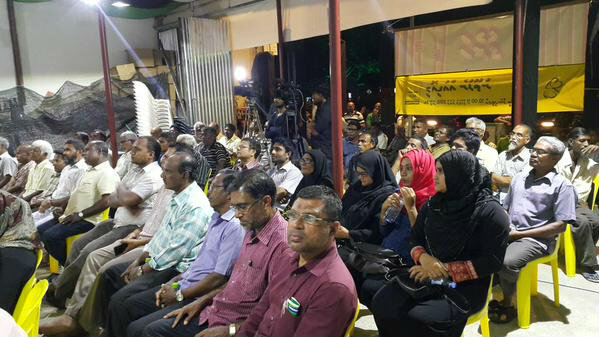 The nightly rallies are part of the opposition’s campaign against tyranny to free ex-president Mohamed Nasheed and ex-defense minister Mohamed Nazim, who were respectively sentenced to 13 years and 11 years in jail in trials criticized for lack of due process. In a letter to Sangu TV on June 30, MDP said privately-owned Raajje TV owned exclusive rights to broadcast rallies at the Haruge. Sangu TV should respect the decision and come to an agreement with Raajje TV on broadcasting Haruge events, the party said. “They cannot live broadcast from a private location after somebody else has been given exclusive right. 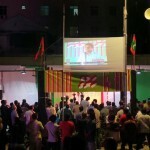 It’s similar to how specific channels are given rights to live broadcasts to a football match,” Mahloof said. That same night, the front doors at the MDP’s headquarters were vandalized. The party said it is uncertain if the two events were related, while the station denies any connection. Sangu TV was launched on April 30 with several former staff at Raajje TV. The station is owned by MP Abdulla Yameen, who defected from the MDP to the ruling Progressive Party of the Maldives (PPM) this year. Some opposition supporters have called for a boycott of Sangu TV after the row. Sangu is the Dhivehi word for the conch shell. It was the name of a dissident magazine produced in the early 90s by former president Nasheed.